This group was started in response to a dredge of our local lake in 2015. Two years ago, three children had the idea to save the salamanders from the surrounding lake and advocated to local government officials to try to make it happen. They attended meetings, stood up in front of adults and tirelessly fought to save the vernal pools at our local lake. Out of their efforts, Salamander Savers was born. This year our Salamander Saturday event will be held at Woodglen Lake in Fairfax on Saturday May 5th from 10:00 am-12:00 pm. 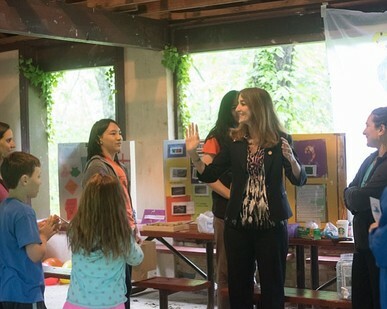 Salamander Saturday celebrates all of the 56 species of the salamanders in Virginia, bringing games and educational material to the public-free of charge. Last year our group's event was featured in the Connection newspaper. The kids have talked to over 350 people about their salamander projects last year. We'd love to be able to share our passion for conservation with your group. 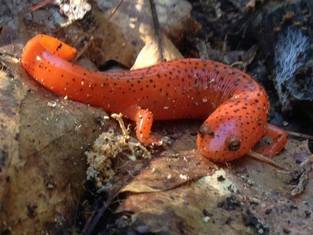 Please let us know if you are interested in a visit from a salamander advocate. Details: Street parking is available near the intersection of Fireside Ct. and Southport Ln. The entrance to the lake is at the end of Fireside Ct., near Bonnie Brae Elementary. There are no bathroom facilities at the park. The red salamander will be the official state salamander of Virginia in July of 2018!!! In 2018, Delegate Eileen Filler-corn agreed to sponsor HB 459 for us which would name the red salamander the state salamander of Virginia. The red salamander is a beautiful, brightly colored salamander that lives in a variety of woodland habitats throughout the state. It is a member of the Plethodontidae family, a group of lungless salamanders that breathe through their skin. Because of their unique respiration, their environment needs to be free of toxins or they will absorb the pollutants through their skin. We hope that by bringing attention to the red salamander, we will help spread awareness for the 56 different species of salamanders that live in Virginia. Salamander Savers was featured in the Washington Post and WTOP for our salamander advocacy. We are made rain barrels to raise funds for chytrid and ranavirus testing at Woodglen Lake. We also have future programs to make bird and bat houses please contact us if you have materials, skills and time to donate. ​​All of our members participate in at least one stream monitoring session a year. The kids learn how to count and identify macro invertebrates in our local stream, Sideburn Run. When we started monitoring the stream two years ago, it was the worst in the county. We have seen vast improvements in the stream's overall health, but it still has a long way to go. The kids get to see first hand how different things, like pesticides directly effect our streams. Their observations are reported to the county and the results have helped improve our local ecosystem. We monitor the stream four times a year and record all the data, sending it into Fairfax County. ​As we spend more time out in nature, the kids become more connected to the environment and start to notice small things. One of our members found dragon fly larva that was metamorphosizing. Recently, we found fish in our stream (which is a big deal for us- since everything was taken out during the dredge.) The kids are the greatest observers of life and stream monitoring gives them a chance to actually make a difference in their local environment. It is exciting to watch the changes in the environment and see the children's response. The children have made a video explaining their water concerns over the last two years. This video was presented to the Water Advisory Council on January 10, 2018. 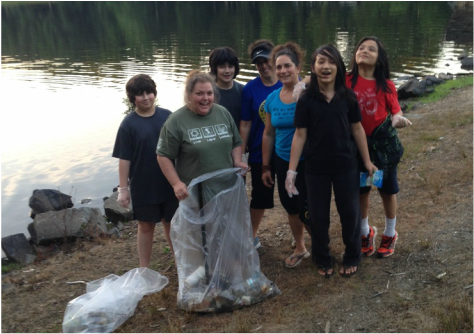 There are many opportunities throughout the year to do lake clean ups. We collect trash and then recycle or reuse it. This year we actually used kayaks to collect trash in our lake. Every year there are opportunities to do salamander surveys throughout Virginia. We travel far and wide looking for opportunities to help salamanders. All of our members are given the opportunity to assist in salamander surveys. Last year we conducted our own surveys in a local park. The kids made the data sheets and are learned to record data. To date we have recorded over 100 salamanders in the local park. Last year's surveys revealed salamanders that have not been documented in 10 years! This year we are hoping to find funding so that we can continue our salamander research. The kids have been working diligently to record data that will help us better understand the threats to salamanders across the state. We are hoping to work with two local parks this year to do more testing and advocate for better publishing of our findings. The kids are hoping to be able to raise money by selling rain barrels to fund their research. If you are interested in buying a rain barrel please contact us.